I LOVE German pancakes!! 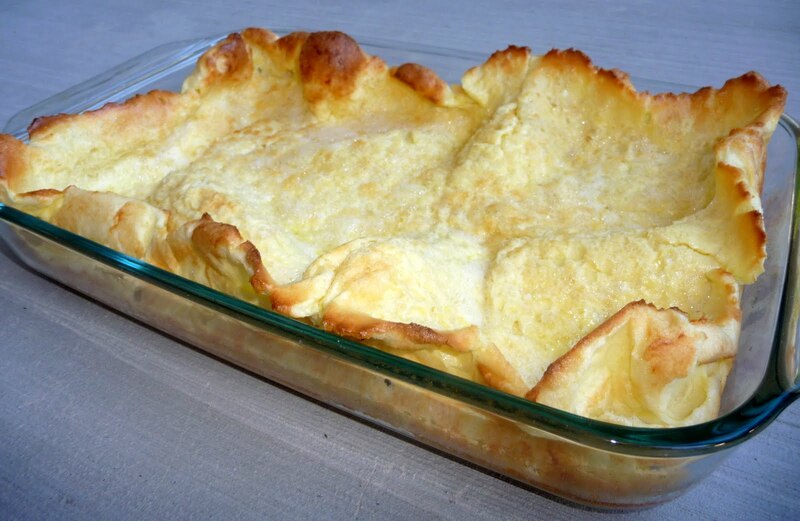 !It is one of my family’s favorite breakfasts!It is so simple to make and tastes delicious! I also love the way it looks in the pan after its all cooked up. In a blender, combine eggs, milk, flour and salt until smooth. Melt butter and pour into 9×13 pan; then add batter. Bake uncovered at 400 F for 20 minutes. YEAH . . printable posts . . now, lazy old me can get busy with my FAV recipes . . . KISSES are being blown your way. I LOVE German pancakes! My Papa used to make them for me when I was little. I've been on a break from eggs due to a baby with an egg issue, but it seems to have cleared up, so I think I'll go make a German pancake! YUM! We love these, although I grew up calling them hootananies. I've never heard of these before but they look yummy and easy, so count me in! Thanks for sharing! I've never try a German pancake before. Looks and sound delicious. it's so simple to make too that I gotta try it soon. Thanks for sharing. I am now DROOLING on my computer!! Cake batter pancakes!!! OMG!!! Thanks for your comment on my blog, I am following you, I may start with your "Died and Gone to Heaven" recipe!! I'm following you back, you amazing cooking mama! Thank you so much for stopping by "Mama Leisha." You made my day! Thanks for reminding me how much I like this dish, and how easy it is to make! 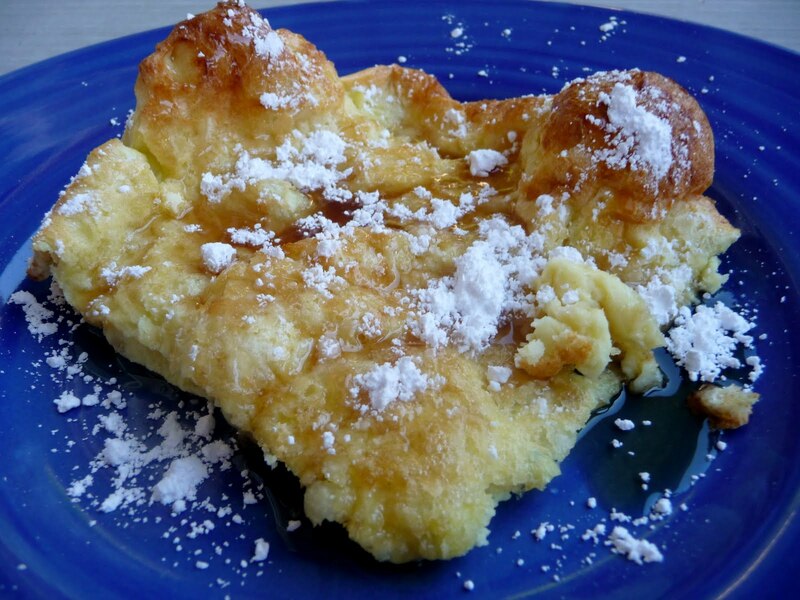 German Pancakes are just right to serve with fresh berries or fruits, along with the standard squeeze of lemon and sprinkle of powdered sugar. Yum. Looks good, how much batter do we add? Has anyone tried this yet? I'm not the best cook, and I'm having a hard time wrapping my mind around the fact that it needs 6 eggs yet only 1 cup of flour. Does it taste more like eggs than pancakes? Those arent real german pancakes. Though they look yummy. Tried these this morning. Followed the recipe precisely, but mine didn't turn out like the photo. The sides did not bubble up to the same heights, and it seemed more eggy, thick, and doughy. I just need to say that this kind of Pancake is not really German. In Germany pancakes are fryed in a pan. This version baked in oven is coming from Finnland/ baltic states, as I know. Btw...I love your homepage and recipes!!! I tried this over the weekend but mine never puffed up. Do you beat the eggs first and then add the other ingredients? I put everything together in a blender, like your recipes states, and got what my family termed "egg cake" at the end of the cooking process. No puff what so ever. Should eggs be at room temp? Please help as I really want to try this again. I am from Germany and this pancake recipe ist not from Germany. Our Pancakes are like thiker crepes and made in a pan for 3-4 minutes. puuh i never heard of pancakes like these here in germany .. so i am confused why they called german pancakes. but they look tasty that way :) maybe will try them soon. That is just want my grandma has always called them, so it has stuck :) If I ever figure out why they are called German Pancakes, I will let you know :) Regardless of the name, they sure are delicious! Thank you so much for stopping by. I've been making these for a few years, and had one even this morning. I added a little salt, vanilla and about a tablespoon of lemon zest, which I had made a while ago and froze. I bake mine in a cast iron skillet and it comes out like a souffle. 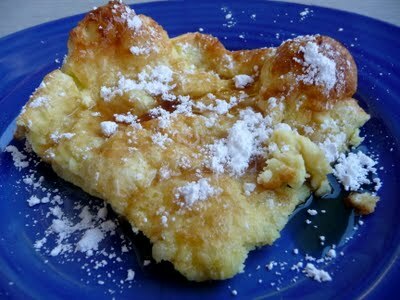 I was wondering myself why they are called German Pancakes, so did a Google search and found your site. Go girl! I found this recipe on Pinterest and can't wait to try it! Just to let you know, Pinterest warned me that the link looked suspicious, so you might want to email them and contest the warning. I usually heed those, but when I hovered over the pic and looked at the URL I could see it was a legit sounding one. Glad I took the chance! This is exactly the recipe my mom uses for German Pancakes. I came looking for a recipe because I couldn't remember what temperature to bake them at. I just wanted to share a dirty-one-less-dish tip. If you pit the butter in the baking dish while the oven is preheating your butter will be melted and ready when you're ready to pour in the batter. Thanks for the recipe! I just made this with whole wheat pastry flour and it's totally flt and uncooked in the middle, any thoughts as to why? German chocolate cake did not originate in Germany. Its roots can be traced back to 1852 when American Sam German developed a type of dark baking chocolate for the American Baker's Chocolate Company. The brand name of the product, Baker's German's Sweet Chocolate, was named in honor of him. My mom made German pancakes when I was a kid. Somehow, I managed to lose her recipe. She passed away recently, and I am anxious to try this. Thank you so much. Mom's recipe was for thinner pancake, like French crepes, but this one looks delicious as well. Can't wait to try it! I have many wonderful memories of Gerrman pancake suppers, especially during the Friday meat-free meals of Lent. Again, thank you so much! Mom always served these with a squirt of lemon juice, then sprinkled with powdered sugar. These pancakes were a great alternative to fish. I'm still not a big fan of fish. how many servings does your german pancakes make?